Am I advocating ‘NO HEAT’? This only came up from a comment on one of my earlier posts, straightening hair…..NOT an advocate. The comment was about removing all forms of heat from her hair care regimen. I stopped and thought about it for a minute…..am I suggesting I do the same or advocating a ‘NO HEAT’ lifestyle? First of all I must say I do use a heat cap for my deep conditioning. *watch me duck and hide after my confession*. Sorry, but I do. I really hadn’t thought about it and maybe I’ve found another technique I’m using that was part of my relaxed days. I decided to check this technique of mine out on Natural hair sites and blogs I truly respect and find insightful. I did look on other sites and blogs and found either some who chose to use heat as a means of deep conditioning or others who totally removed heat from their hair regimen. I must say the sites that strayed from heat altogether were the sites I found more knowledgeable as well as sites I usually gravitate to for information. So, I guess the heating cap is getting thrown into the basement with the curling iron, hooded hair dryer and flat iron. I’ve given up on those three long ago but now with the addition of the heating cap, the heat crew is finally complete. I’m now advocating ‘NO HEAT’ on Natural hair and faithfully following the Curly Girl Method. See, I’m just like so many Newly Naturals out here still learning what to do on this Natural hair journey. Some of us are holding onto old methods until we learn they are no longer necessary or just right out dangerous to our Natural tresses. I just never looked into deep conditioners with heat to see if it was good or bad. I knew the dangers of hooded dryers, curling irons, and flat irons, but what I was doing with my wet hair with conditioner slathered in and applying heat was just as dangerous! You learn something new everyday. Just wanted to share my enlightenment and so grateful for the comment to make me dig a little deeper and see if I was hurting or helping my hair. Deep conditioning will consist of the conditioner sitting on my hair for a few hours if not overnight because that does work for my schedule. To each HER own, but Sabrina will be turning her back on heat for good. I do have a steamer and only use it about once a month. I normally deep condition with just a plastic cap and go about my business around the house or at my workout (natural heat). I think that most say that adding heat does no more than what the bottle tells for the conditioner… and in most cases it doesnt suggest heat at all. That is one of those urban myths and a time extending habit of most salons to be able to do more heads at one time. I pretty much stay away from heat as much as possible and only tend to diffuse on a rare occasion and normally on a cool setting. Remember do what gives your hair the most success. Thanks for the post and you are right. It's just like going outside with a wet head will cause you to get sick. That's a lie also. I am finding more and more old habits I've got to shed. Just allowing the conditioner to sit on my head overnight does a wonderful job for my hair. When I deep condition, I use two plastic caps AND a towel wrapped on my head for at least an hour. On one occasion I did an overnight pre-poo using the same cap/towel method. This seems to generate sufficient heat for maximum product absorption. I tend to think of heat as overrated. Without the heat, my hair seems better than ever but Vet is absolutely right: Do what gives you and your hair the greatest success. Welcome to the No Heat Club. JazzWife, I truly apprecated your comment becuase it got me to thinking about why I was using heat in the first place. I was using it becuase I had ALWAYS used it for deep conditioning as opposed to thinking logically about it. Sometimes I have to step back and analyze my methods to see if they are sound. Overnight with a conditioner in my hair always worked best for me so I'm sticking with that method and cancelling the heat. Thanks for the welcome. I feel like I graduated or something! Do you wash your hair in cold water? I'm just curious because warm water would be considered heat on your hair. My hair is natural and very healthy, I have a steamer and I use it twice a month. I also flat Iron my hair on occasion and wear natural and protective styles as well. 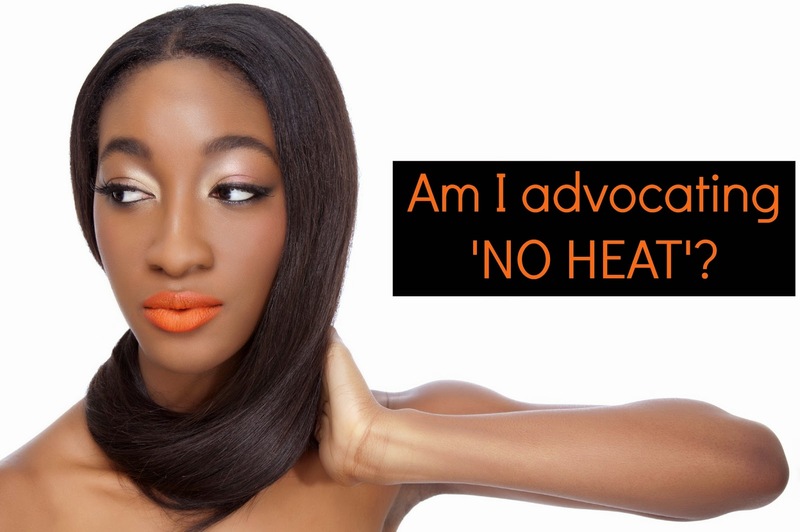 I am a licensed cosmetologist and I know for a fact that using heat in moderation is not going to damage hair. There is a time and place for everything under the sun and that includes heat on hair. Acutally I co-wash and wash my hair in cool water and rinse in cold water. I understand what you are saying but even one application of heat with a flat iron can causee heat damage. Does every application of heat causes damage? NO, but it can only take one application to cause it. I don't want to take that chance and I don't have to be a cosmotologist to know what is best for my hair. I have been trusting hair stylists with my hair for years and thought they were doing right by me and my hair but they were puttin those chemicals in my hair which were actually harmful to my hair. This is not a rant against hair stylists nor am I angry at any former hair stylist I have ever gone to in the past. I am just expressing to you that just because a professional tells me something doesnt mean I am not intelligent enough to make an informed decsion on my own. I chooose to no longer use heat and you choose to use heat. To each HER own.